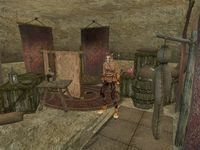 The St. Olms Canal South-Two is the residence of Dro'Sakhar accessed from outside and located on the Canalworks level in the southern part of the St. Olms canton in Vivec. There is a variety of containers, such as sacks, crates and barrels, containing mostly random ingredients and cheap food. The only exception to this is a crate in the northeastern corner, which contains up to 5 gold (60% chance each) and also has a 25% chance of storing an restore attribute potion, as well as a small chance of containing random special and marksman loot. In the northwestern corner, screened by guar skins, is Dro'Sakhar's hammock. Beside the hammock, on a shelf, rests a bent probe and an apprentice's probe. Roughly in the middle of the room is a table, on top of which lies an iron dagger and 25 gold coins. Along the wall east is a training dummy impaled with two iron daggers. 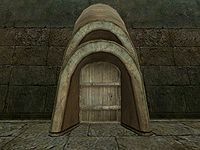 Dro'Sakhar's Bounty: Fulfill the bounty on a Khajiit outlaw in Vivec. This page was last modified on 8 September 2018, at 04:10.